By Aoife Power | October 7, 2010. As the weather changes, we become more susceptible to coughs, colds and influenza. Not only does the drop in temperature affect how well the body’s immune system works, but it also makes travel for airborne viruses much easier. In the high humidity of summer, water particles in the air cling to free-floating viruses; weighed down they fall to the ground instead of being breathed in. In autumn, the crisp cool air is perfect flying space for these little critters so we can find ourselves under attack every day as we trek off to work, school, college or the shops. What can we do to protect ourselves in the cooler months and make sure we are top of our game every day? First and foremost, hygiene is hugely important to prevent colds and flus – simple things like washing your hands can drastically reduce your chances of getting cold. If you’re grabbing bars on packed buses, or holding onto a handle on a rush-hour luas, it may be worth your while carrying a bottle of disinfectant hand gel in your coat pocket. They say an army marches on its stomach, so it’s important for you to feed your little soldiers well. Your immune system needs you to keep it in tip-top shape if it’s going to spend the winter in the trenches. Eating a balanced diet keeps your body topped up on all the vitamins and minerals it needs to keep those defences strong, and fruit and vegetables are your primary weapon. Dark green, red and yellow fruits and vegetables contain lots of phytochemicals, essential for winning the war against colds and flus. Eating a tub of yoghurt every day can reduce your chances of getting cold by up to 25 per cent! Get plenty of sleep and reduce your stress, get some exercise. It’s a great way of reducing stress, staying healthy and keeping off the winter flab. Make sure your home isn’t overheated – stepping out of a house that’s too hot into a cold October morning is an awful shock to your immune system, distracting your troopers from the real fight. Overheating your house also decreases the humidity, drying out your nasal passages and making it much easier for colds and flus to take hold. Remember to wrap up warm when you’re heading out, a drop in body temperature can kick-start viruses lying dormant in your system. Invest in a good pair of waterproof boots. If your feet get wet your three times more likely to get the flu, the little expense of buying a new pair of boots or a funky pair of willies will be nothing compared to the expense of missing work, getting doctor certs for sick days, or just the sheer inconvenience of lying around sick. So, what to do if all that fails? You may have lost the battle but the war is not over! There are lots of things we have in our kitchen which are great for treating a cold, so when you feel the first symptoms coming on start rummaging in the veggie drawers and arm yourself with these chemical weapons. Lemon, grapefruit and orange juices are all antiseptic and have uplifting properties. Orange can bring down a temperature; grapefruit stimulates the lymphatic system and fights fevers; lemon cleanses and purifies. This store-cupboard favourite can soothe sore throats and banish the irritation of tickly coughs. It can also give relief from headaches, and promotes relaxation. Ginger is an antiseptic, a stimulant, an expectorant and good for joint pain. Root ginger can be made into a tea (especially good if combined with honey). Grated into foods it adds flavour as well as being beneficial to the body. Garlic has anti-bacterial properties to help the immune system fight infection. It can also be an effective remedy for chest infections. Try to include a form of garlic in your diet to help prevent colds. Echinacea strengthens the immune system and can shorten the length of a cold or flu infection. Echinacea can be used in tea as a preventative measure, and can be found as herbs, herbal tea bags, and in liquid form from your pharmacy or health store. Eucalyptus is an antiseptic essential oil and works on the respiratory tract. It can soothe inflammation and clear catarrh from the head and sinuses. 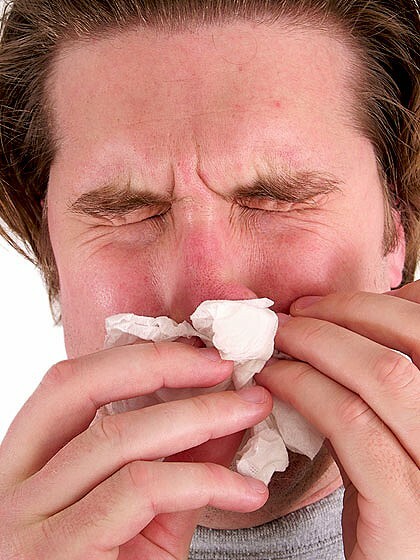 A few drops on a tissue or handkerchief inhaled at regular intervals will relieve the discomfort of nasal congestion. Rosemary can ease headaches and sore throats, and also has an uplifting quality. It can be gargled with a diluted syrup to ease a sore throat, or drank as a tea to treat an aching head. Rosemary can be bought as a dried herb or an essential oil. Sage is useful for treating head colds and restoring the appetite. Sage leaves can be drank as a herbal tea throughout the day. Thyme fights infections, relieves low spirits and can combat exhaustion. Drink as a tea to increase your fluid intake. My personal favourite however, would have to be The Hot Toddy. It almost makes a cold enjoyable to sit on the couch in fluffy pyjamas with a steaming glass of whiskey, hot water, lemon and honey, and a few cloves if they’re in the cupboard. Remember to put a metal spoon in the glass before pouring in the hot water, as the metal conducts the heat away from the glass to stop it from breaking, and make sure you inhale all those wonderful vapours. Most importantly take the time to get better; spending two weeks with sniffles and coughs is unattractive, inconvenient and uncomfortable. Rest and relaxation are key.